Washington state's Energy Northwest sold $635 million of electric revenue bonds that utility officials say will save ratepayers hundreds of millions of dollars. The tax-exempt and taxable refunding bonds were priced May 9 and represent the sixth transaction to restructure debt by the joint operating agency, which includes 22 utilities and five cities including Seattle and Tacoma as members. The program, which began in 2014, will result in savings of $2 billion, said John Irvan, finance manager for Energy Northwest. The deal includes bonds for the Columbia Generating Station. "It creates this huge amount of savings for the region and ultimately taxpayers," he said. The deal includes $230.2 million in tax-exempt bonds for the company's Columbia Generating Station, a nuclear generator about 160 miles southeast of Seattle, and $399 million for Project 3, a partially completed nuclear facility about 70 miles southwest of Seattle. It also includes about $5.7 million in taxable bonds. 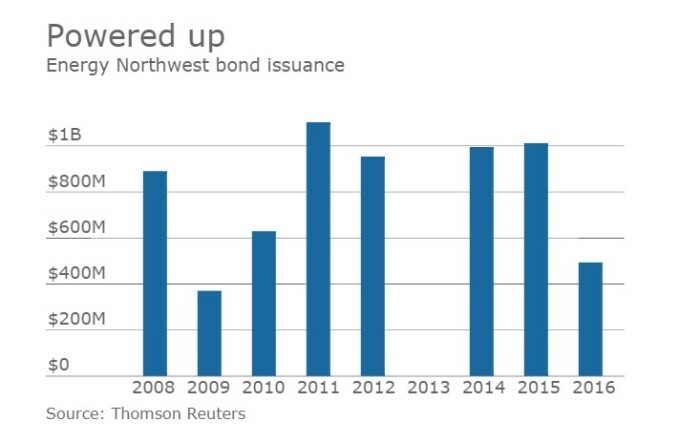 The bonds are secured by revenues from Bonneville Power Administration, the federal power marketing administration that is the main power supplier for the Pacific Northwest. The lower-cost, tax-exempt Energy Northwest debt allows Bonneville to pay back higher interest federal debt early, Irvan said. "It frees up their borrowing authority with the federal government," he said. Energy Northwest has partnered with Bonneville on the Columbia Generating station and Project 3. The deal was rated Aa1 by Moody's Investors Service, AA-minus by S&P Global Ratings and AA by Fitch Ratings. Moody's assigns a stable outlook, citing federal government support "strong underlying hydro and transmission assets, very competitive power costs, and long-term power supply contracts with customers through 2028." Fitch attributed its negative outlook to "the cumulative pressure of declining cash reserve levels combined with Bonneville Power Administration's high debt burden, rate pressures and the financial variability of net second secondary revenues for a hydroelectric utility." Foster Pepper PPLC is the bond counsel and Public Financial Management, Inc. is the financial advisor. The underwriters are JPMorgan, Citigroup, Wells Fargo Securities, Bank of America Merill Lynch and Pierce Fenner & Smith.